The Sam Houston State University Alumni Association is seeking donations to restore an 1894 MP Moller, Inc., organ that is being stored in the Sam Houston Memorial Museum. Preliminary estimates range between $40,000 and $50,000 for the restoration, which would include refabricating and replacing pieces of the organ and reassembling it, according to Mac Woodward, curator of collections at the Sam Houston Memorial Museum. "The organ is made mostly out of wood and leather," said museum director Patrick Nolan. "Some of the small, individual pieces of wood are cracked and split, and some of the pipes and attachment items that are made of leather have deteriorated and will probably be replaced. "It's in very good shape; it's just disassembled-like a big jigsaw puzzle," he said. Woodward said the major expense in restoring the organ is resurfacing the sounding board, where the smaller pipes fit into, with wood. Reassembling the organ, which takes a lot of time and skill, is also part of the expense. "It's like restoring the Mona Lisa. It takes a full-time organ-restoring professional. It's a very time consuming job," he said. "Parts will have to be refabricated, and he'll have to do that all individually, piece by piece. You don't go down to the store and buy a piece of an 1880 organ anymore." Nolan said they are considering using the same man who restored the organ in the late 50s to perform the task this time. George Miles, chair of the Alumni Association Board of Directors Development Committee, which has taken charge of the project, said the committee is enthusiastic about it. "Two people on the development committee are real excited about this and have already started to try to find donors," Miles said. "We have a lot of things we're working on, but this is obviously one of the things we want to accomplish. "The organ has so much historical significance that we feel like it is something that the Alumni Association wants to get involved in," he said. The organ was originally purchased to be installed in the Old Main Building and not only is significant to the university, but has historical significance as well. "Old Main had an assembly room upstairs on the top floor, like a big auditorium room, and the organ was installed in that. 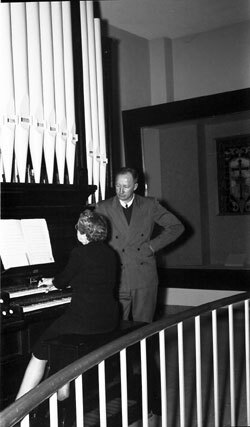 So, it was the first organ installed in an academic building west of the Mississippi River," Nolan said. After the area in Old Main was needed for other purposes, the organ was moved to St. Stephens Episcopal Church and subsequently moved to the museum. The organ resided in the west wing until the area was redone. Along with seeking donors for the project, members of the development committee are seeking a permanent home for the restored organ. "What we're hoping is that with the thoughts of obtaining donors to restore it, that we can work with the university to find a permanent place where it can be viewed and used on special occasions and social events," Miles said. "It's a pipe organ. I'd say the tallest pipes are probably 15 to 18 feet high and from side to side, and it's probably another 12 to15-feet across," Nolan said. "It needs a spot to go where it can be shown off; it's a centerpiece. It's the sort of thing that when you walk in and see it, it's like "Oh, wow, look at the organ.' The wood is all mahogany and oak and polished up very nicely and all the pipes, they have gilding on them, so they would be shining gold." "We want it to be repaired and housed in a permanent and prominent place on the campus where not only the people like me, who remember it from years past and have a lot of fond memories of it, but the students of today and in the future will get to enjoy it," he said. "It will be one of those objects that students will remember as a pleasant part of their experience while they were at Sam Houston." Woodward said the organ was once used by the music department and hopes they will utilize it after the restoration. "They were having concerts up here using the organ in the museum," he said. "So I think it could be reincorporated into some things that the university does. We're excited about the possibility of having it restored and putting it back into use." Contributions to the Old Main Organ fund can be made to: the SHSU Alumni Association, Box 2022, Huntsville 77341-2022.